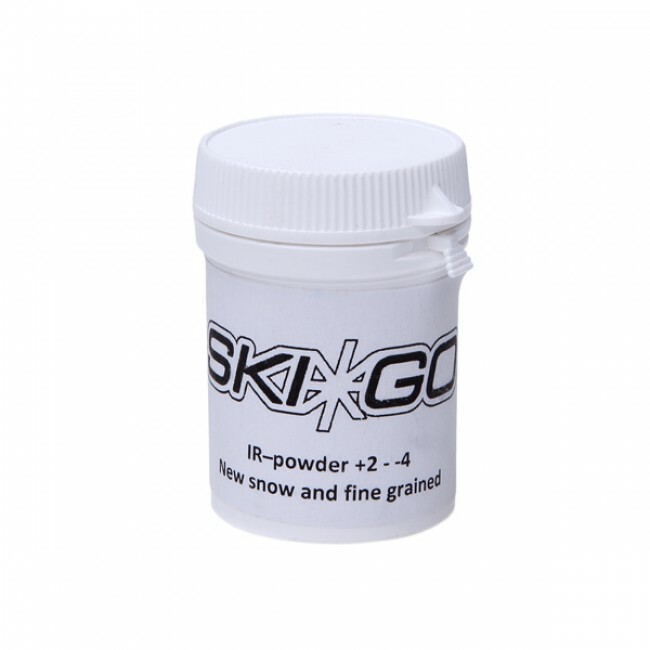 WC Service IR Powder was developed for new snow and temperatures between +2°C and -4°C. It perfectly works on very fine snow with some humidity in it. Ski-Go fluoro powders are widely used and popular with both national teams and the world elite. The long-distance competitors' favourite. 1. Apply SKIGO LF Graphite, then scrape and brush. 2. Apply the HF wax appropriate for the day's snow conditions. Scrape and brush. 3. Sprinkle the day's fluoro powder evenly over the glide zone. 4. Tack down the powder with the waxing iron and then evenly and quickly iron the glide zone moving tip to tail. Use a high temperature so that you don't have to iron back and forth. Moving the iron slowly or back and forth may damage the base. 5. Let the skis rest for about 20 minutes; if possible, longer. 6. Brush immediately before you go out on the trail if possible. Recommended brushes include the Horsehair Brush, the Fine Steel Brush and the Nylon Brush. Copyright © SKIWAX. All rights reserved. The controller of the personal data of the online shop is WWW.SKIWAX.EE (registry code 12571202), located at Regati pst 1, 11911 Tallinn, phone +3725229232 and email info@skiwax.eu. Personal data are used to manage the customer’s orders and deliver goods. Purchase history details (date of purchase, goods, quantity, customer’s data) are used for preparing summaries of goods and services purchased and for analysing customer preferences. The bank account number is used to reimburse payments to the customer. Personal data such as email, phone number and the customer's name are processed to handle any issues relating to the provision of goods and services (customer support). The IP address or other web identifiers of a user of the online shop are processed for the provision of the online shop as an information society service and for web use statistics. Personal data are processed for the purpose of performing a contract concluded with the customer. Personal data are processed for performing legal obligations (such as accounting and the settlement of consumer complaints). Personal data are transmitted to the customer support of the online shop for managing purchases and purchase history and for settling any problems that the customers may have. The name, phone number and email address are transmitted to the transport service provider selected by the customer. When the goods are delivered by a courier, the customer’s address is also transmitted together with the contact details. If the accounts of the web shop are kept by a service provider, the personal data are transmitted to the service provider for performing accounting operations. Personal data may be transmitted to IT service providers if this is necessary for ensuring the functionality of the online shop or for data hosting. Personal data are stored in the servers of ____, which are located on the territory of a member state of the European Union or states of the European Economic Area. Data may be transferred to the countries whose data protection levels have been assessed as adequate by the European Commission and to the companies in the USA who have joined the Privacy Shield framework. Personal data can be accessed by the staff of the online shop in order to settle technical issues related to the use of the online shop and to provide customer support. The online shop takes appropriate physical, organisational and IT security measures to protect personal data against accidental or unlawful destruction, loss, alteration or unauthorised access and disclosure. Personal data are transmitted to the data processors of the online shop (such as the providers of transport and data hosting services) and processed under contracts concluded between the online shop and the processors. The processors must ensure appropriate safeguards when processing personal data. Personal data can be accessed and rectified in the user profile of the online shop. When a purchase has been made without a user account, personal data can be accessed through customer support. Where personal data are processed on the basis of the customer’s consent, the customer has the right to withdraw his/her consent by notifying customer support by email. Personal data are erased upon the closure of a customer account of the online shop, unless the storage of the data is necessary for accounting purposes or for the settlement of consumer disputes. For online purchases made without a customer account, the purchase history is stored for three years. In the event of disputes concerning payments and consumer disputes, the personal data are stored until the claim is satisfied or until the end of the limitation period. Personal data needed for accounting purposes are stored for seven years. For the erasure of the personal data, customer support must be contacted via email. requests of erasure are responded to no later than within one month and the period of erasure shall be specified. Requests to transmit personal data submitted via email are responded to within one month. Customer support identifies the person and indicates what personal data are to be transmitted. Email address and phone number are used for sending direct marketing messages if the customer has given the respective consent. If the customer does not want to receive direct marketing messages, the customer should select the relevant link at the footer of the email or contact customer service. Disputes concerning the processing of personal data are settled through customer support (CONTACT DETAILS). The supervisory authority is the Estonian Data Protection Inspectorate (info@aki.ee).